The VLOOKUP function in Excel is a tool for looking up a piece of information in a table or data set and extracting some corresponding data/information. 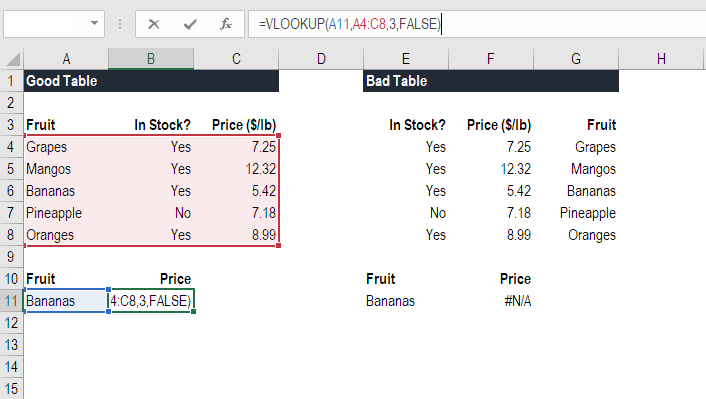 In simple terms, the VLOOKUP function says the following to Excel: “Look for this piece of information (e.g., bananas), in this data set (a table), and tell me some corresponding information about it (e.g., the price of bananas)”. Learn how to do this step by step in our Free Excel Crash Course! To translate this to simple English, the formula is saying, “Look for this piece of information, in the following area, and give me some corresponding data from another column”. Lookup_value (required argument) – Lookup_value specifies the value that we want to look up for in the first column of a table. Table_array (required argument) – The table array is the data array that is to be searched. The VLOOKUP function searches in the left-most column of this array. Col_index_num (required argument) – This is an integer, specifying the column number of the supplied table_array, that you want to return a value from. TRUE – Approximate match, that is, if an exact match is not found, use the closest match below the lookup_value. FALSE – Exact match, that is, if an exact match not found, then it will return an error. The first step to effectively using the VLOOKUP function is to make sure your data is well organized and suitable for using the function. 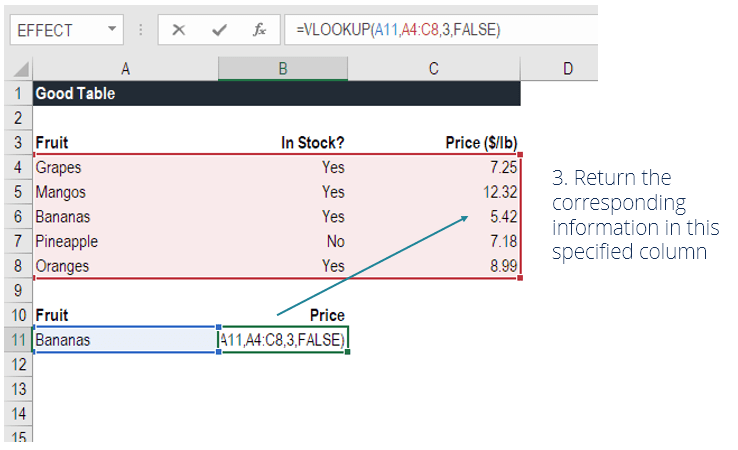 VLOOKUP works in a left to right order, so you need to ensure that the information you want to look up is to the left of the corresponding data you want to extract. 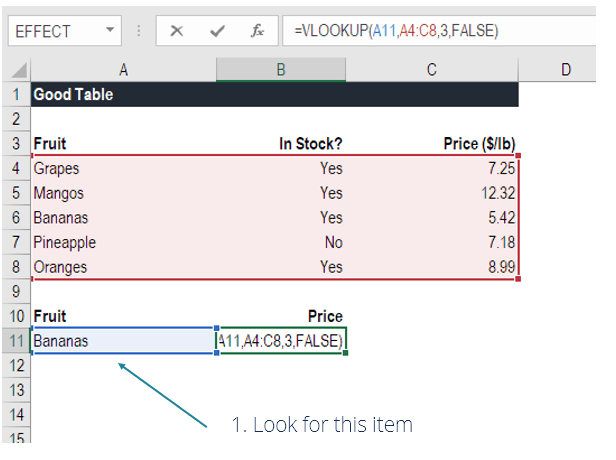 In the above VLOOKUP example, you will see that the “good table” can easily run the function to lookup “Bananas” and return their price, since Bananas are located in the leftmost column. In the “bad table” example you’ll see there is an error message, as the columns are not in the right order. This is one of the major drawbacks of VLOOKUP, and for this reason, it’s highly recommended to use INDEX MATCHIndex Match FormulaCombining INDEX and MATCH functions is a more powerful lookup formula than VLOOKUP. Learn how to use INDEX MATCH MATCH in this Excel tutorial. Index returns the value of a cell in a table based on the column and row number and Match returns the position of a cell in a row or column. Learn how to them in this guide instead of VLOOKUP. In this step, we tell Excel what to look for. 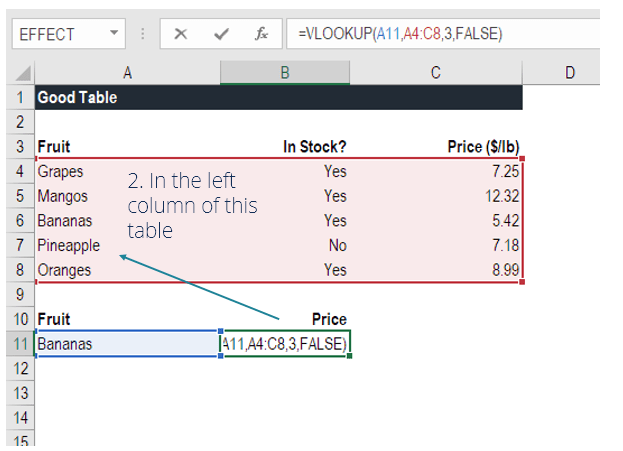 We start by typing the formula “=VLOOKUP(“ and then select the cell that contains the information we want to lookup. In this case, it’s the cell that contains “Bananas”. In this step, we select the table where the data is located, and tell Excel to search in the leftmost column for the information we selected in the previous step. For example, in this case we highlight the whole table from column A to column C. Excel will look for the information we told it to lookup in column A. In this step, we need to tell Excel which column contains the data that we want to have as an output from the VLOOKUP. To do this, Excel needs a number that corresponds to the column number in the table. In our example, the output data is located in the 3rd column of the table, so we enter the number “3” in the formula. This final step is to tell Excel if you’re looking for an exact or approximate match by entering “True” or “False” in the formula. In our VLOOKUP example, we want an exact match, so we type “True” in the formula. An approximate match would be useful when looking up an exact figure that might not be contained in the table, for example, the number 2.9585. In this case, Excel will look for the number closest to 2.9585, even if that specific number is not contained in the dataset. This will help prevent errors in the VLOOKUP formula. VLOOKUP formulas are often used in financial modeling and other types of financial analysis to make models more dynamic and incorporate multiple scenarios. For example, imagine a financial model that included a debt schedule, where the company had three different scenarios for the interest rate: 3.0%, 4.0%, and 5.0%. A VLOOKUP could look for a scenario, low, medium or high, and output the corresponding interest rate into the financial model. 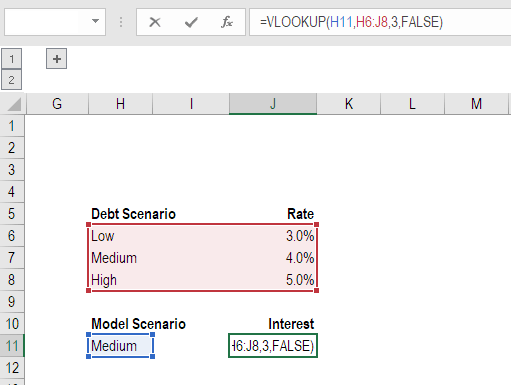 As you can see in the example above, an analyst can select the scenario they want and have the corresponding interest rate flow into the model from the VLOOKUP formula. The biggest limitation of the function is that it always looks right. It will get data from the columns to the right of the first column in the table. If the lookup column contains duplicate values, VLOOKUP will match the first value only. The function is not case-sensitive. Suppose there’s an existing VLOOKUP formula in a worksheet. In that scenario, formulas may break if we insert a column in the table. This is so because hard-coded column index values don’t change automatically when columns are inserted or deleted. VLOOKUP allows the use of wildcards, e.g., an asterisk (*) or a question mark (?). Suppose the table we are working with the function contains numbers entered as text. If we are simply retrieving numbers as text from a column in a table, it doesn’t matter. But if the first column of the table contains numbers entered as text, we will get an #N/A! error if the lookup value is not also in text form. #N/A! error – Occurs if the VLOOKUP function fails to find a match to the supplied lookup_value. The formula attempted to reference cells that do not exist. The range_lookup argument is not recognized as one of the logical values TRUE or FALSE. This has been a guide to the VLOOKUP function, how to use it, and how it can be incorporated into financial modeling in Excel. Even though it’s a great function, as mentioned above, we highly recommend using INDEX MATCHIndex Match FormulaCombining INDEX and MATCH functions is a more powerful lookup formula than VLOOKUP. Learn how to use INDEX MATCH MATCH in this Excel tutorial. Index returns the value of a cell in a table based on the column and row number and Match returns the position of a cell in a row or column. Learn how to them in this guide instead, as this combination of functions can search in any direction, not just left to right. To learn more, see our guide to INDEX MATCHIndex Match FormulaCombining INDEX and MATCH functions is a more powerful lookup formula than VLOOKUP. Learn how to use INDEX MATCH MATCH in this Excel tutorial. Index returns the value of a cell in a table based on the column and row number and Match returns the position of a cell in a row or column. Learn how to them in this guide. Excel Keyboard shortcutsExcel Shortcuts OverviewExcel shortcuts are an overlooked method of increasing productivity and speed within Excel. Excel shortcuts offer the financial analyst a powerful tool. These shortcuts can perform any functions as simple as navigation within the spreadsheet to filling in formulas, or grouping data.